This song has a slightly different character than anything else we've worked on so far. It's definitely a blues, but somehow it sounds cheerful at the same time. Notice the unusual phrase lengths of the verses. It's actually a classic 12 bar blues form but, to me anyway, it feels novel in this bluegrass/string band context. This one is particularly fun to play and sing so have at it! For me it is impossible to play in that speed: base note, down up, base note, up down up. I cannot figure what you are really doing going fast and light. New to the class and was wondering if there was an order to older lessons or any order is okay. Hi Jim, welcome! There is a rough progression of information from the beginning through the most recent lessons where the newer lessons are building on things we've already talked about/worked on. I would encourage you to go through at least the White Dove and Honey, You Don't Know My Mind lessons first because in those I address some fundamentals that I think are pretty important. Let me know if you have any other questions! Thank you Chris for the video. I spent over an hour playing different notes and listening. I really like your approach to playing and teaching, and am looking forward to working my way through the lessons. I seem to have an emotional attachment to sounds, which I think is similar to what you are saying, but I am sure it is much less developed. However, I have trouble finding the sounds when I need them on guitar, but practicing playing notes yesterday was fun, and really helped. I am OK to grab many chords, but working on expanding my vocabulary. When playing the harmonica, I can almost always find sad, angry, the right sound....to go with what someone may be playing on another instrument or saying in a song, so I am looking forward to crossing that bridge on guitar. Ok - I figured I'd put this video practice of the 1st couple of Nashville Blues lessons. I can't help myself but once a new lesson goes up I find myself happy to start it even though I haven't finished Banks of the Ohio or Gold Rush but I'm closing in onit (not to mention Soldier's Joy). Too much fun for one old dude to handle. Timing issues here as well as mastery of the moves and notes but I've only just begun to pick ha ha. 3) And a third thing that you could try is crosspicking a forward roll on the low notes at 0:18 and 0:48. Hello Chris, I am new to the site, and have gone through the the first couple lessons. I am a song writer and looking to keep up a little better with my Bluegrass buddies at jams. I ran onto a lesson on youtube, just by chance, and a couple things you said really caught my interest. You spoke briefly about notes having color and feel, and that is a link I make when I here other artists play (Kruger Brothers come to mind), but can't seem to find it on the neck of a guitar. Also, I would fit as the guitar player who plays pre-programmed from tab when playing a break. I get mistaken for being better than I am if I play a song I have practiced forever. Several things of no importance: My wife and I had the pleasure of meeting Nick Forster at Merlefest last year, spent almost an hour with him...good guy, then met up with him again at a Hotrize fest in Black Mountain. I have have been using the Monel strings, they really bring a nice tone to my guitar, a Larrivee D-40R, hope you don't hold that against me. I read the article in Accoustic Guitar Magazine about you and the jazz guitarist playing vintage Martins. Hi Brooks, welcome to the site! Because the concept of color is so elusive and personal (and therefore difficult to write about!) I made a short video talking about how one might go about cultivating the ability to hear the "color" of different notes. In the video I just went up the scale but try jumping around a bit and see if these notes make you feel anything even without the context of a song. I think it really has to do with mindfulness. The concept of notes and even chords having color is a beautifl ... verbal way to describe how I feel when writing, playing, or listening to a song. For most of my life ... when I played or wrote ... I was happy to play in the most basic and simplist way possible. I think it is because I'd never had a music or guitar lesson and to be honest I'm just not that great of a picker even though I have played at playing for most of my life. For the past several months my senses are beginning to come alive as I discover colorful and vibrant alternative ways to play the same song. What used to be a great unknown and scary place for me, i.e., up the neck is becoming less and less initmidating. My playing is slowly getting better but my melodies have improved quite a bit. I stumbled around a bit but I'm very happy to have landed here. I've got a handful of guitars that I really love but the one that I have played on all of the videos here on Sonicjunction.com is a wide-necked 1939 D-28. I bought this guitar back in 2010 after returing the 1937 D-28 that used to belong to the late, great Charles Sawtelle and that was graciously loaned to me by its current owner, Nick Forster. In 1939 Martin made a few significant structural changes to their guitars with the biggest being the change in nut width from 1 3/4 to 1 11/16 of an inch. There were also some big changes to the bracing structure under the upper bout including adding an extra "popsicle" brace. 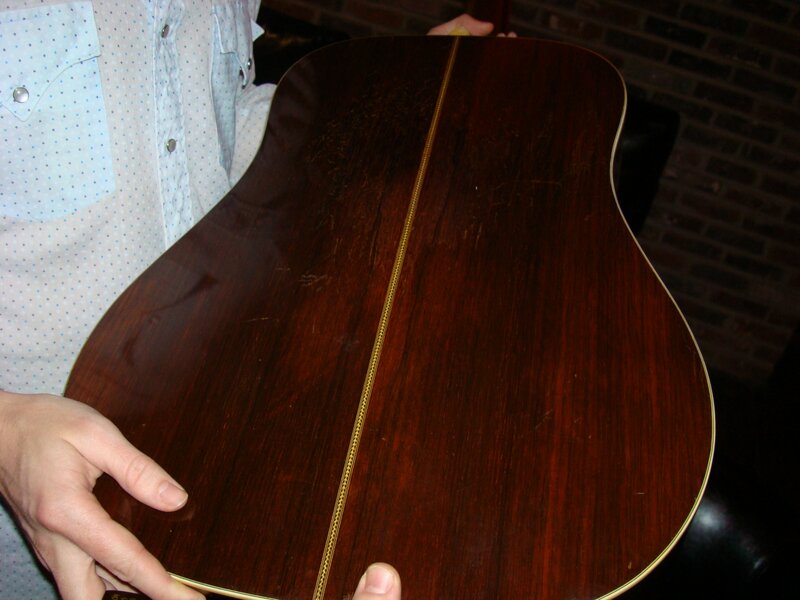 My guitar was finished in March of 1939, before those changes took place. It is very responsive, plays well, is extremely balanced, but also has a great mid-rangey voice and some good growl. It also has a very unique feature for a D-28: a herringbone backstrip. Apparently every D-28 in the batch that mine is from (about 12 guitars) had herringbone as a backstrip instead of the usual zigzag backstrip that the D-28s had before and after. I can only assume that they were running low because of the war? It's a great guitar and I'm glad you asked about it! It's name is Herschel, btw. Show us a picture of the back, pretty please. I was talking to Wayne Henderson about that batch of herringbone-backed herringbones just last week. Someone had brought one into the shop. Not quite as nice as yours--it had been retopped by Martin with Sitka sometime in the 1960s. While we're being gear geeks. What kind of strings do you prefer? And I know you're a Blue Chip guy, but what size/thickness pick do you use? Allen, I'm visiting my folks in FL for the next couple of days but I will upload a picture of the backstrip when I get home in a few days. As to why the name Herschel: I have no idea! It just kind of appeared in the ether one day. Herschel. There you go. I don't have any allegiance to one brand of strings these days. For years I used John Pearse Medium Phosphor Bronze or 80/20 Bronze, depending on the guitar. Lately I'm less picky. Each brand has different characteristics that might suit different guitars. For instance, I like DRs on my old D-18. I like D'adarrios on others. I like the Pearses on others. I will say: I've never played a coated string that I liked better than its uncoated counterpart. I'm about to do some experiementing with picks. But again - choosing which pick to use is like pairing specific strings with specific guitars. I might use a thin, round cornered pick on one song, and a thick, pointy one on another. It really just depends on the musical context and objective. All of that said, my main pick last year on tour with Punch Bros was a TAD-60. I hope that isn't obnoxiously vague! Thanks so much, Chris. I do think we're at an interesting place string-wise. Used to be D'Addarios or Pearses in phosphor bronze. Or 80/20 if you were thinking crazy. Those remain good solid choices, but I've found Newtones (a UK boutique brand) sound great on certain vintage guitars, applying a kind of Brazilian "ring" that's perfect on mahogany, but too much on a rosewood guitar. Martin Monel "Retros" are also great in a different way, really warm and fundamental. Endorsed by Tony and great for vintage pieces. And now D'Addario has a nickel/bronze hybrid coming out next month that sounds super promising, according to a vintage-nut friend (and monster player) who was a beta tester. I thought the name was a Herschel Sizemore shout-out. Or maybe Herschel Walker. Hopefully not the one-legged guy from The Walking Dead. Here's a link to a not-great pic of the herringbone backstrip that was posted on UMGF back in the day. Not impressed? He'll see your D-18 and raise you a herringbone. A 12-fret herringbone. A shaded top 12-fret herringbone. Amazing when a working musican could afford guitars like these. Chris - that was a very cool perspective of why you like the song and a point well taken. I will try and keep it in mind when hearing a song that strike my fancy. I'll go an check Norman's performance out. Side note - the same thought as Bryan has below was running through my head particularly the part about your guitar.